Dr. Hovda is the Director of the UCLA Brain Injury Research Center. He is Past President of the National Neurotrauma and International Neurotrauma Societies. He has served as Chair of study sections for the National Institute for Neurological Disease and Stroke (NINDS). Dr. Hovda has received a number of awards for his research on brain injury and recovery of function, including the 1991 National Head Injury Foundation Award, the Giannini Foundation Award, the Benjamin Franklin Haught Memorial Award, the 2008 Deborah L. Warden Lectureship Award and named the Lind Lawrence Eminent Scholar for his work on the topic of Traumatic Brain Injury. In addition, Dr. Hovda received the 2006 Women in Neurotrauma award for his teaching and support of women in neuroscience. In 2010, Dr. Hovda participated in the Blue Ribbon Panel on Traumatic Brain Injury and Post-Traumatic Stress convened by General Peter W. Chiarelli and has continued his involvement with the military under the direction of Generals James Amos and Joseph Dunford. On June 15, 2011, the Secretary of the Army presented Dr. Hovda the “Strength of the Nation Award”, the highest award given to a civilian from the United States Army, in recognition of Dr. Hovda’s efforts to help military personnel suffering from mild traumatic brain injury returning from theater. In 2012, Dr. Hovda received the Alumni Association’s James F. Zimmerman Award from the University of New Mexico. Dr. Hovda is internationally known for his translational work on the pathobiology of traumatic brain injury and has devoted most of his career to understanding the mechanisms of recovery of function. Dr. Hovda has consulted with Major League Baseball, the National Football League, National Hockey League and World Boxing Council. He continues to serve as a consultant for professional sporting organizations, as well as the Veteran’s Administration and Department of Defense, addressing issues related to traumatic brain injury and recovery of function. Dr. Hovda received his doctoral training at the University of New Mexico. His 1985 doctoral thesis described how amphetamine administration can restore binocular depth perception after damage to the visual cortex. Dr. Hovda completed his postdoctoral training at the Mental Retardation Research Center at UCLA conducting research on the topic of neuroplasticity and recovery after cerebral hemispherectomy. This work resulted in several discoveries addressing how the young brain can reorganize itself in order to enhance recovery of function after it has been damaged. In 1989, Dr. Hovda was recruited by the Division of Neurosurgery to direct its scientific efforts to understand the cellular pathophysiology of brain injury. In 1990, the UCLA Brain Injury Research Center was created under Dr. Hovda’s and Dr. Donald Becker’s oversight incorporating teaching, research, patient care and service for the field of traumatic brain injury. In 1989, Dr. Hovda was recruited by the Department of Neurosurgery to direct its scientific efforts to understand the cellular pathophysiology of brain injury. This work resulted in providing the backbone for UCLA being recognized as a "Center of Excellence" by the National Institutes of Health.He has devoted most of his career to understanding the mechanisms of recovery of function. Dr. Hovda is the Director of the UCLA Brain Injury Research Center. He is a former President and current President - Elect of the National Neurotrauma Society and study section committee chair for the National Institute for Neurological Disease and Stroke (NINDS). 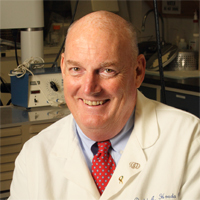 He is the current chair for the Brain Injury and Neurovascular Pathologies study section for the NINDS and has been elected President of the International Neurotrauma Society (2009-2012). Dr. Hovda has received a number of awards for his research on brain injury and recovery of function, including the 1991 National Head Injury Foundation Award, the Giannini Foundation Award, the Benjamin Franklin Haught Memorial Award and named the Lind Lawrence Eminent Scholar for his work on the topic of Traumatic Brain Injury. In addition Dr. Hovda received the 2006 Women in Neurotrauma award for his teaching and support for women in neuroscience. Dr. Hovda is most well known internationally for his translational work on the pathobiology of traumatic brain injury. To determine if reduced cognitive capacity following TBI is the result of dysfunction in the molecular mechanisms that support synaptic plasticity. The major goals of this project are to determine mechanisms involved in oxidative stress and energy crisis in traumatic brain injury, and the possibility to modulate free radical formation by restoring brain homeostasis. To determine whether voluntary exercise up-regulates BDNF following traumatic brain injury. To determine the use of ketone bodies as an alternate metabolic substrate following traumatic brain injury in the developing brain. This application focuses on the consequences of traumatic brain injury on the human brain to utilize oxygen. Traditional measurements of the cerebral metabolic rates for oxygen will be compared to magnetic resonance spectroscopy to determine the degree of mitochondrial dysfunction as it relates to posttraumatic atrophy. The primary goal of this project is to characterize the morphological, behavioral and molecular response to traumatic injury in the immature brain as it relates to enriched environment-induced experience-dependent plasticity. The impact of substance abuse on mortality in patients with severe traumatic brain injury. O'Phelan K, McArthur DL, Chang CW, Green D, Hovda DA. J Trauma. 2008 Sep;65(3):674-7. Persistent metabolic crisis as measured by elevated cerebral microdialysis lactate-pyruvate ratio predicts chronic frontal lobe brain atrophy after traumatic brain injury. Marcoux J, McArthur DA, Miller C, Glenn TC, Villablanca P, Martin NA, Hovda DA, Alger JR, Vespa PM. Crit Care Med. 2008 Oct;36(10):2871-7. Duration of ATP reduction affects extent of CA1 cell death in rat models of fluid percussion injury combined with secondary ischemia. Aoyama N, Lee SM, Moro N, Hovda DA, Sutton RL. Brain Res. 2008 Sep 16;1230:310-9. Epub 2008 Jul 9. Voluntary exercise or amphetamine treatment, but not the combination, increases hippocampal brain-derived neurotrophic factor and synapsin I following cortical contusion injury in rats. Griesbach GS, Hovda DA, Gomez-Pinilla F, Sutton RL. Neuroscience. 2008 Jun 23;154(2):530-40. Epub 2008 Apr 9. Time window for voluntary exercise-induced increases in hippocampal neuroplasticity molecules after traumatic brain injury is severity dependent. GS, Gómez-Pinilla F, Hovda DA. J Neurotrauma. 2007 Jul;24(7):1161-71. The fate of glucose during the period of decreased metabolism after fluid percussion injury: a 13C NMR study. Bartnik BL, Lee SM, Hovda DA, Sutton RL. J Neurotrauma. 2007 Jul;24(7):1079-92. Pericontusional brain tissue exhibits persistent elevation of lactate/pyruvate ratio independent of cerebral perfusion pressure. Vespa PM, O'Phelan K, McArthur D, Miller C, Eliseo M, Hirt D, Glenn T, Hovda DA. Crit Care Med. 2007 Apr;35(4):1153-60. Increased pentose phosphate pathway flux after clinical traumatic brain injury: a [1,2-13C2]glucose labeling study in humans. Dusick JR, Glenn TC, Lee WN, Vespa PM, Kelly DF, Lee SM, Hovda DA, Martin NA. J Cereb Blood Flow Metab. 2007 Sep;27(9):1593-602. Glucose metabolism after traumatic brain injury: estimation of pyruvate carboxylase and pyruvate dehydrogenase flux by mass isotopomer analysis. Bartnik BL, Hovda DA, Lee PW. J Neurotrauma. 2007 Jan;24(1):181-94.